This article is from M/A 2003 Rolling with the missing pictures included (they ran out of space). Chrome, new arm rests & waterproofing. Do you have enough SNOW? I do been out several times shoveling and blowing and it hasn’t stop yet. So if you don’t have enough come to the Bronx and you can have mine. I’ve been replacing the rocker panels and the lower parts of the fenders where they meet. It’s lots of work to break all the spot welds to get the old stuff off. I had removed the original Chrome molding some years ago and since the car needs a paint job anyway, I’m going to put the original stuff back on. It’s a ’66 1800S by the way. If you do any work on ’66 and older cars be careful when you remove the chrome. They are held on by clips that have screws and nuts. They DO NOT pop off. You can ruin them and it is hard to find replacements. Even the rear fin molding is held on this way. Some of the nuts are hard to get to especially the one on the rear fin near the door and the front on the front fender. To do this work I also had to remove the doors. So the upholstery had to come off. There are a few things I want to make you aware of and tell you about a modification I made. The early cars had a very nice looking arm rest but the quality was not the best and if you own one of the early cars, your are probably cracked and falling apart. I had the same problem and had purchased a set of fiberglass that Bob Stein got Impact Parts to make back in the early 80’s I believe. The only problem was that they were extremely HARD. I had to drive with a piece of foam under my arm. The new cover that are available and are made of ABS, I believe, are a lot better. I modified the doors to use the arm rests from the E and ES. 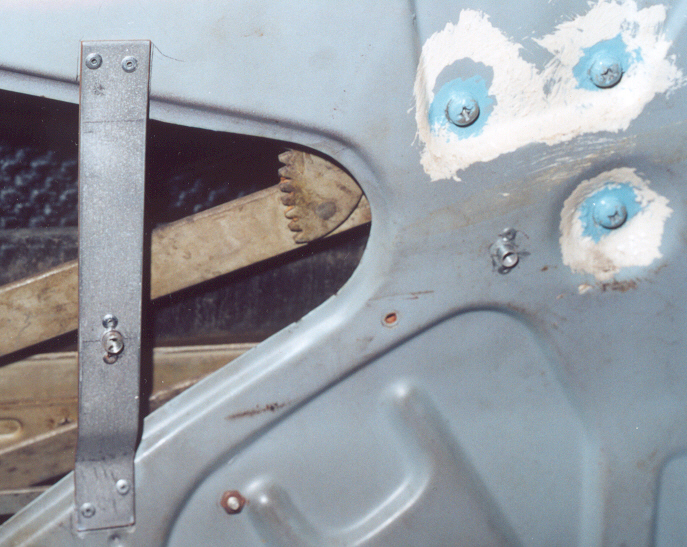 The two pictures show how I made a hole for the front attachment. I goofed and had to move the hole. A bracket was made for the rear screw. I used ‘T’ nuts for them and held them in place with pop rivets. 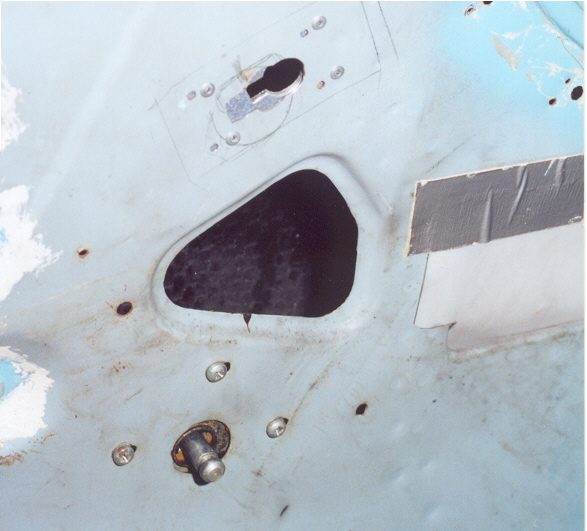 If you look at the front key hole you will notice a piece of mylar duct taped in place. If you ever worked on the doors of these cars you should have run into some heavy paper taped in place and a piece of plastic over this. 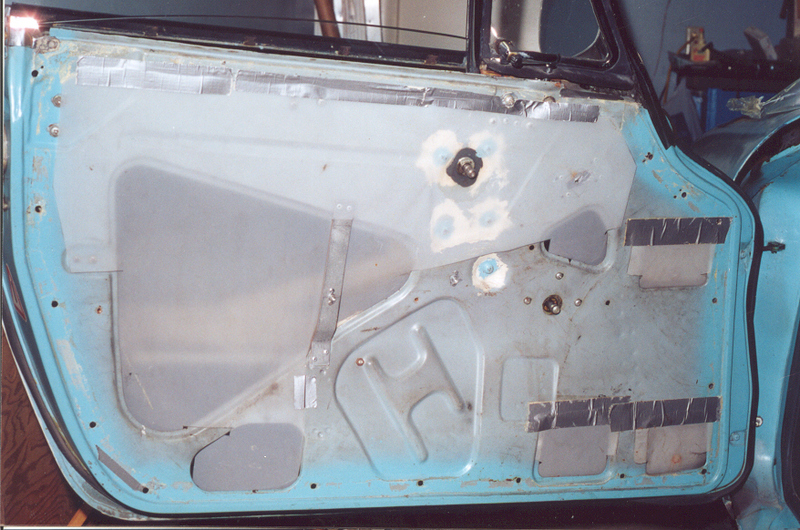 This was put on before the upholstery panel is put on. Most repair people just tear this stuff off and throw it away. 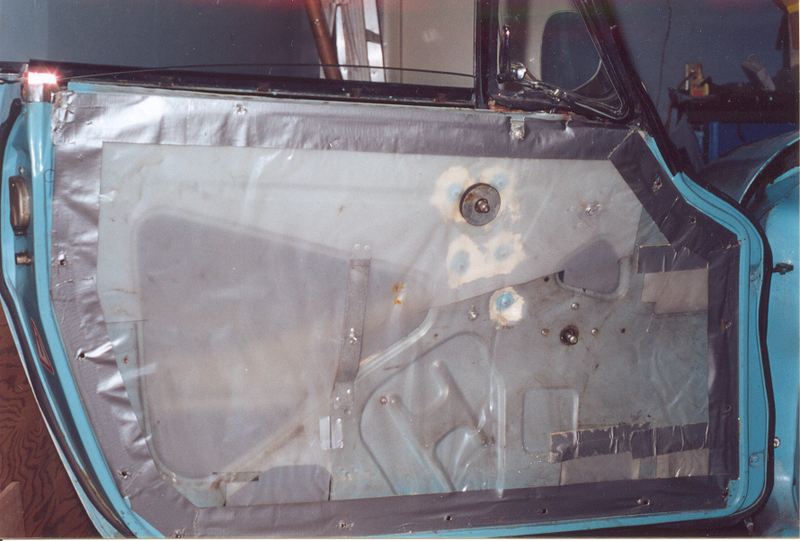 This stuff was put on to keep the water that run down around the window inside the door from getting to the backing of the upholstery panels. This stuff is like a heavy cardboard or masonite. AutoMat uses plywood on theirs. The photo’s show the doors with the mylar in place (I cut them out from drawing film) and the sheet plastic duct taped in place. So now you have a use for all that duct tape and plastic you purchased due to the terrorist scare.